Mahmoud Abbas' Fatah party boasts that one of three terrorists who murdered Hadas Malka was Fatah member. 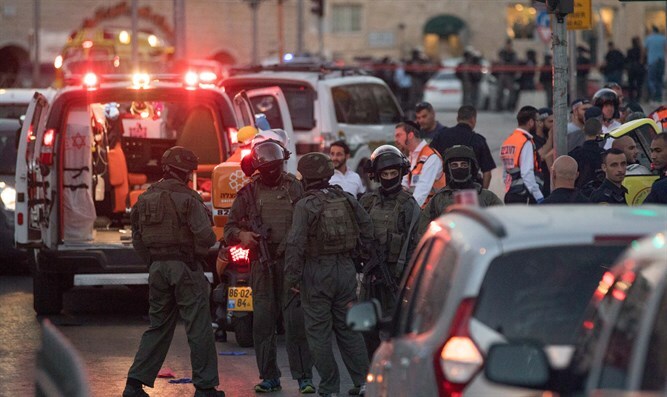 One of the three terrorists responsible for the murder of Border Police officer Hadas Malka Friday evening was a member of Palestinian Authority chairman Mahmoud Abbas’ Fatah party, the Middle East Media Research Institute (MEMRI) has reported. Despite President Trump’s push for a renewal of peace talks The PA itself has refused to condemn Friday’s terror attack, perpetrated by three Arab terrorists armed with rifles and knives. The attack took place at approximately 7:30 p.m., when two terrorists opened fire on Israelis near the Old City of Jerusalem. A third terrorist stabbed Malka, before being shot and killed by other security forces on the scene. All three terrorists involved in the attack were eliminated. Both the ISIS terror group and Popular Front for the Liberation of Palestine have claimed responsibility for the attack. At least one of the members of the terror cell, however, was apparently a member of the Fatah movement, which is often portrayed as a moderating force in the Palestinian Authority. Yet for all the claims of moderation, Fatah has condemned not the murder of the Israeli officer, but rather the deaths of the three terrorists who killed her. "Fatah condemns the acts of the Occupation, which murdered three young men in Jerusalem," the Fatah party said in a statement to the press, calling on the international community “to provide protection for the unarmed Palestinians” in the wake of the terror attack. The movement’s official Facebook account boasted that one of the three, Osama Ahmad Atta, was a card-carrying member of Fatah, MEMRI reported. "The Fatah movement in Deir Abu Mash'al in the Ramallah and Al-Birah region mourns, with great pride, its martyr hero Osama Ahmad Atta... perpetrator of the heroic operation at the Damascus Gate," the post reads.